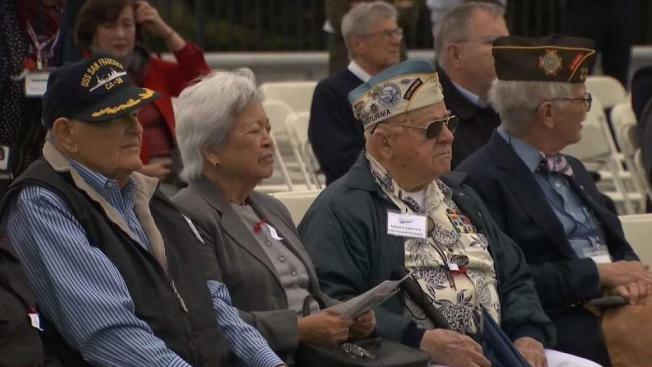 An emotional ceremony was held at the Golden Gate National Cemetery in San Bruno Saturday honoring veterans of the Bataan Death March during World War II. The 75,000 U.S. and Filipino prisoners of war who were forced to march for days in scorching heat in the Philippines, knowing that at the end of their march, would be more pain, suffering and possibly death. Many were severely beaten along the way and tens of thousands died. "We feel good to have the pleasure of honoring the public," said a ceremony attendant. "They're all alive and get out of bed in the morning and they walk in the sunshine." Veterans of the Battle of Leyte Guld, believed to be the largest naval battle in world history, were also honored.